Website and processes: 7 Sep 16 Emma, 5/5 Excellent "Detailed activities and easy purchasing procedure." Our Helicopter Trial Lesson allow you to experience the thrill of flying and will even count as the first step towards your Private Pilot's Licence. 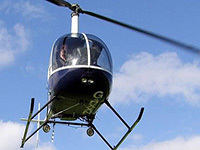 The trial lesson is preceded by a short flight briefing with our instructor who will explain all aspects of the flight including the effects of controls and how a helicopter flies. The student will then be allowed to take the controls and actually fly the aircraft! A trial lesson will give an insight into the thrills of flying and you will receive a certificate signed by our instructor. A truly fabulous gift for anyone of any age and also a perfect introduction to flying for those who have always wanted to try flying a helicopter. Maximum weight is 17 Stone (109 kg); maximum height is 6' 6" (1.98 m).